Search.cl-cmf.com is the PUP that uses misleading techniques to prevent removal. Use Reimage to locate malicious components and get rid of them faster than with uninstall instructions. A full system scan blocks virus reappearance and prevents traffic to malicious domains. Should you be concerned about Search.cl-cmf.com infecting your browser? Who or what is responsible for the hijacker infiltration? What is the best way to deal with Search.cl-cmf.com removal? Search.cl-cmf.com virus is a lure that malware creators try to attract unsuspecting computer users with. Especially, it targets online gamers who cannot go a day without finishing some exciting new level or two. Search.cl-cmf.com promises to make this experience more convenient by offering links to free gaming websites including TerraArcade, BigFish games, Addicting games, as well as Minecraft, Roblox, and Skincraft login pages. Reaching your favorite websites directly from your homepage might seem like a good idea at first, but rarely do the computer users set this website as their default by their own will. More commonly, the website shows up on the computer without any warning. After closer investigation, we have also revealed its close connection to a well-known browser hijacker — Safer Browser. This connection often signals that the related domain is also a part of the browser hijacker infection. Looking at Search.cl-cmf.com, you can see the warning signs pretty clearly. That this site is untrustworthy can even be suspected after examining the provided quick links. Some of them lead to unreliable gaming, while other links do not work entirely. These aspects alone are good reasons to carry out Search.cl-cmf.com removal. If you are ready for that — go ahead and run Reimage or some other trustworthy malware scanning tool. Shady redirects bring us to the initial purpose of Search.cl-cmf.com hijack — advertising. The website links you can see on this domain are most likely affiliated with the hijacker developers who receive revenue from their advertising. Nevertheless, this pay-per-click strategy is not only a problem of the quick links. Search.cl-cmf.com redirect issue is also highly pronounced in this suspicious site’s search results. They mostly include commercial content, links to retail sites and various services. Careless advertising may quickly become a cause of malware infection or involvement in some online scam as well. If you previously had any doubts whether to remove Search.cl-cmf.com from your computer or not, we hope you have now made up your mind and can proceed to the virus removal recommendations below. Search.cl-cmf.com virus can slither into your computer without being noticed when installing freeware or shareware applications. Browser hijackers, in particular, are the type of potentially unwanted programs that rarely spread individually. Thus, they when they attach to freeware they can also drag some other malware with it. The users who are installing new applications on their computers are recommended to remain vigilant and stay on the trusted and verified parts of the Internet, avoid downloading pirated software and always check whether the downloaded programs are not bundled with some undesirable applications, like Search.cl-cmf.com. No matter how convenient it might be, Search.cl-cmf.com virus will not vanish from your computer on its own. It must be eliminated with the user’s initiative. There are two different ways to remove Search.cl-cmf.com from the corrupt computer, so you have to carefully choose the one which suits your and your computer capabilities better. First one is the manual Search.cl-cmf.com removal technique. It is useful in cases when there are problems with computer’s performance capacities or memory. But if your computer is running smooth and you have a couple of gigabytes of free space on it — we recommend automatic virus removal. The antivirus utility will scan your entire system, leaving no undesirable files behind and you will be able to enjoy a virus-free computer. Search.cl-cmf.com is a virus that can infect both Windows OS and Mac operating systems. You should never forget that the virus creators are not willing to let the users remove their malicious creations that easily. They will try to obfuscate them, hide them under different titles, etc. In other words, you will not find a program on your computer, running under the name of Search.cl-cmf.com. You will have to find the disguised PUP that is causing all the havoc by analyzing the list of your recently installed applications and additionally inspecting all the potentially dangerous components. Here, look for Search.cl-cmf.com or any other recently installed suspicious programs. When you decide to remove Search.cl-cmf.com from your Mac OS, don’t try looking for an application with this exact name — you will probably won’t find it. Instead, browse through your software and look for suspicious applications that you may not remember installing and remove them if you find them to be related to the Search.cl-cmf.com virus. Wait until you see Applications folder and look for Search.cl-cmf.com or any other suspicious programs on it. Now right click on every of such entries and select Move to Trash. When in the new window, check Delete personal settings and select Reset again to complete Search.cl-cmf.com removal. Once these steps are finished, Search.cl-cmf.com should be removed from your Microsoft Edge browser. Here, select Search.cl-cmf.com and other questionable plugins. Click Remove to delete these entries. Now you will see Reset Firefox to its default state message with Reset Firefox button. Click this button for several times and complete Search.cl-cmf.com removal. Here, select Search.cl-cmf.com and other malicious plugins and select trash icon to delete these entries. Click Reset to confirm this action and complete Search.cl-cmf.com removal. Here, select Extensions and look for Search.cl-cmf.com or other suspicious entries. Click on the Uninstall button to get rid each of them. Here, look at the Homepage field. If it was altered by Search.cl-cmf.com, remove unwanted link and enter the one that you want to use for your searches. Remember to include the "http://" before typing in the address of the page. Now you will see a detailed dialog window filled with reset options. All of those options are usually checked, but you can specify which of them you want to reset. 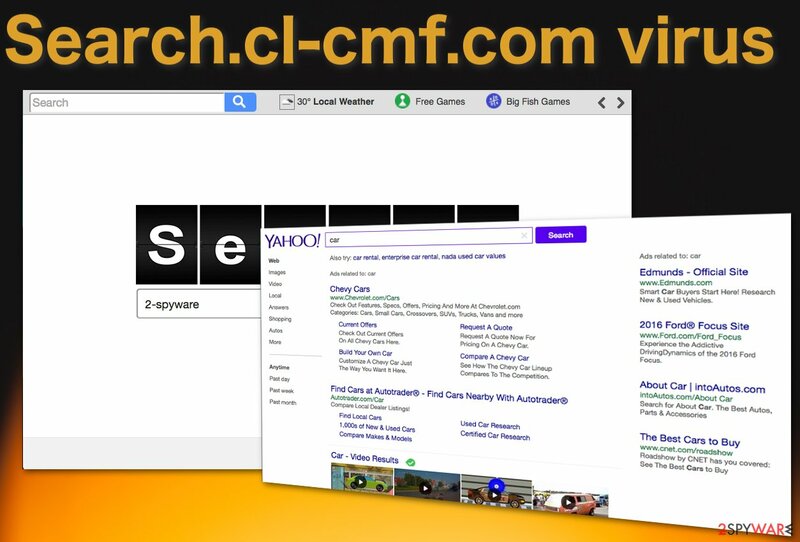 Click the Reset button to complete Search.cl-cmf.com removal process. This entry was posted on 2016-11-11 at 05:50 and is filed under Stealing programs, Viruses. You can quickly scan the QR code with your mobile device and have Search.cl-cmf.com virus manual removal instructions right in your pocket. How did you remove Search.cl-cmf.com virus?